Remember when the whole world looked up. In The Shadow Of The Moon is an intimate epic, which vividly communicates the daring and the danger, the pride and the passion, of this extraordinary era in American history. Between 1968 and 1972, the world watched in awe each time an American spacecraft voyaged to the Moon. Only 12 American men walked upon its surface and they remain the only human beings to have stood on another world. Now for the first, and very possibly the last, time, In The Shadow Of The Moon combines archival material from the original NASA film footage, much of it never before seen, with interviews with the surviving astronauts, including Jim Lovell (Apollo 8 and 13), Dave Scott (Apollo 9 and 15), John Young (Apollo 10 and 16), Gene Cernan (Apollo 10 and 17), Mike Collins (Apollo 11), Buzz Aldrin (Apollo 11), Alan Bean (Apollo 12), Edgar Mitchell (Apollo 14), Charlie Duke (Apollo 16) and Harrison Schmitt (Apollo 17). The astronauts emerge as eloquent, witty, emotional and very human. $38.281 thousand on 4 screens. Almost 40 years after the first Moon landing, only a very select few have set foot on that surface. A mere 12, as a matter of fact, and along with their fellow Apollo astronauts, they reside at the heart of a new documentary called In the Shadow of the Moon. Shadow traces the “space race” with the Soviets and the strides made toward sending a man to the Moon. The astronauts talk about their interest in flight and their pre-space careers as well as preparations for going to the Moon. They also look at society in the late Sixties and offer specific facts and reflections on the Apollo program, with an emphasis on Apollo 11. Unlike most shows of this sort, Shadow eschews the use of various commentators and historians. This is the story of Moon travel in the words of the men who actually did it, and that’s a great take. Sure, some other perspectives would be valuable, but obviously the folks behind Shadow maintained different goals. And they achieved them. Shadow gains a real immediacy because it only uses remarks from the surviving Apollo astronauts (sans Armstrong, that is). Clearly they can boast experiences none of the rest of us share, and it becomes fascinating to hear them discuss those events, especially when matters become personal. If you’ve heard much from guys like this, you’ll know they can often be rather stiff and matter of fact about things. That tendency exists during Shadow - it never becomes a particularly emotional affair – but it doesn’t create problems. Indeed, I think the astronauts seem about as expressive as I can imagine. They’re not given to grand gestures, but they manage to convey their feelings well and allow us a sliver of insight into what it would’ve been like to zoom to the Moon. Bean probably stands as the most entertaining of the bunch, as he shows a sense of fun absent from the most of the others. Don’t take that as a criticism of the various astronauts, as I don’t intend it that way; it’s meant as a reflection that Bean would probably be the most entertaining party guest of the bunch. Shadow nicely balances basic facts and personal insights. It favors the latter to a degree but it also makes sure that we get some useful notes about the space program and the flights. No, you won’t get a thorough, day-by-day history of NASA but you’ll learn enough. In that vein, the archival footage works well. We see a great deal of valuable material and the shots always add to the experience. These give us some excellent views of space travel and other elements, so they bring good life to the show. All in all, In the Shadow of the Moon creates an absorbing look at its subject. I like its perspective, as the use of comments solely from astronauts creates an unusual take on events. This ends up as a thoroughly entertaining documentary. 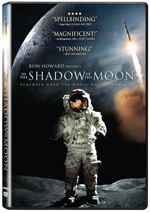 In the Shadow of the Moon appears in an aspect ratio of approximately 1.78:1 on this single-sided, double-layered DVD; the image has been enhanced for 16X9 televisions. With its mix of new interviews and archival footage, Shadow was acceptable for this sort of program. As always, I viewed the old material and the new shots with different expectations. The archival stuff jumped all over the place. It could look pretty good at times, but we also got a lot of messy, ugly clips. I didn’t have any real problems with those, however, as I figured they were about as good as we could get. In any case, the flaws of the old bits didn’t interfere with my enjoyment of the program. They blended just fine and didn’t cause distractions. Perhaps that’s partly because the new shots never looked terribly impressive. The interviews were pretty good but not better than that. Sharpness was usually fine, though some elements could become a bit fuzzy at times. Colors were reasonably natural, though not particularly lively. I thought grain was a bit heavy, but no other defects affected the new footage. Blacks and shadows followed suit, as they seemed decent but unexceptional. Overall, the visuals were acceptable for this kind of show. By the way, kudos to the filmmakers for keeping the archival footage in its original 1.33:1 aspect ratio. Too many modern programs choose to crop clips to match the 1.78:1 dimensions of widescreen TVs, so I’m happy to see that the folks behind Shadow resisted that temptation. Unlike the material for most documentaries, the Dolby Digital 5.1 soundtrack of Shadow was pretty lively. The soundfield opened up the material to a surprising extent, especially in terms of effects. Rocket launches used the side and rear speakers well and better immersed us in the action. Other environmental elements came from those channels, and music featured nice stereo imaging. These pieces fit into the package well. Audio quality was solid. The new interview comments sounded just fine, as they offered perfectly acceptable clarity. No issues with edginess or intelligibility occurred, as they provided warm and natural tones. Music and effects also demonstrated good range and definition. This mix did enough right to earn a “B“. As we move to the set’s extras, we start with an audio commentary from director David Sington, editor David Fairhead, and archive producer Chris Riley. All three sit together for this running, screen-specific chat. They discuss editing and the film’s construction, sound and music, interviewing the astronauts and impressions of them, cinematography, aspects of the archival footage, and some historical background. While not exactly a fascinating commentary, this one proves reasonably useful. It can become awfully dry at times, but it throws out some good tidbits. I like the footnotes about the archival material and the thoughts about editing and assembling the project. This isn’t a great chat, but it deserves a listen. We can watch the movie with or without an Introduction from Ron Howard. In this one-minute and 32-second clip, Howard gives us a brief overview of the film. It’s pleasant but not essential in any way. 18 Bonus Interviews and Stories fill a total of 57 minutes and 27 seconds. Across these we hear from the various astronauts as they discuss topics like their military service, the progress of the space race, and their experiences in the program. These snippets look like they came out of a “finished” version of the movie since they come with archival footage, so they don’t just provide raw interview shots. I don’t get the impression they were dropped for content-related reasons, as they’re uniformly interesting. Perhaps they would’ve made the final product drag, but taken here, they offer lots of good comments and information. In particular, some reflections on the astronauts’ mindset are fascinating. They talk about the personal toll their jobs took on their families and their mental states, and Collins offers a great glimpse of what the astronauts always showed so little emotion. I really like this collection of interviews. Two featurettes follow. 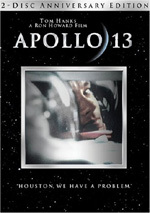 Scoring Apollo lasts 11 minutes, 12 seconds and includes notes from composer Philip Sheppard. He tells us a little about his development as a musician as well as aspects of his score for Moon. We also see parts of the recording sessions. This ends up as a decent look at the movie’s music. Ron Howard: Inspired By Apollo runs six minutes, 34 seconds and provides remarks from Howard. He talks about his experiences with astronauts and his thoughts about Moon. Howard doesn’t tell us much in this fairly fluffy appreciation. A few ads open the DVD. We get clips for War Dance and Nanking. These appear in the Trailer Gallery as well, and we also get the trailer for Shadow. Though many documentaries and feature films have examined the space program over the years, its concentration solely on the words of actual astronauts makes In the Shadow of the Moon unusual and special. The piece offers a great perspective on their experiences and remains consistently fascinating. The DVD presents decent picture and audio along with some good extras highlighted by almost an hour of bonus interviews. This is a satisfying release of a fine film.